STAINES-UPON-THAMES, England, March 26, 2019 /PRNewswire/ — Mallinckrodt plc (NYSE: MNK), a leading specialty pharmaceutical company, today announced the recipient of 2019’s Advancing Extracorporeal Photopheresis (ECP) Immunomodulation Investigator Award. The winning entry was submitted by co-investigator Dr. Rachel Crossland of Newcastle University in the United Kingdom. 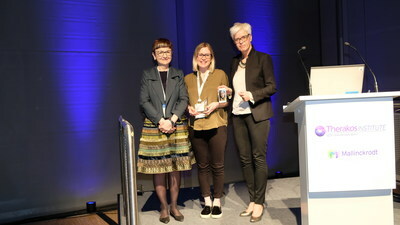 Collaborators on the winning project include Professor Anne Dickinson, Professor of Marrow Transplant Biology, Newcastle University, Professor Hildegard Greinix, Director of Haematology, Medical University Graz, Graz, Austria; and Dr. Aisling Flinn, Clinical Research Associate in Paediatric Immunology, Newcastle Hospitals NHS Foundation Trust. Along with the 2019 Investigator Award, Dr. Crossland’s team will receive an educational grant of €50,000 to support their research. The winner was first revealed at the THERAKOS ECP Immunomodulation™ symposium at the 45th Annual Meeting of the European Society for Blood and Marrow Transplantation (EBMT) in Frankfurt, Germany. Mallinckrodt developed the Investigator Award to mark 30 years of its pioneering THERAKOS ECP Immunomodulation™. The Investigator Award reflects the company’s ongoing commitment to the science of immunomodulation through ECP and its therapeutic applications. Now in its second year, the award recognises individuals and institutions whose research contributes to the advancement of knowledge in this area of medicine. “As a pioneer in ECP immunomodulation, Mallinckrodt is proud to support the work of those who continue to investigate this exciting field of medicine. I congratulate Dr. Crossland and her team, and look forward to seeing the results of their work,” said Steven Romano, M.D., Executive Vice President and Chief Scientific Officer of Mallinckrodt. Entries were invited from clinicians and scientists working on translational or outcomes-based research, as well as collaborative projects. Submissions were assessed on a range of criteria, specifically scientific merit, originality and feasibility. The 2020 Advancing ECP Immunomodulation Investigator Award will be open for entries in September 2019. Full details on how to enter can be found at https://www.therakosinstitute.eu/. Mallinckrodt is the world’s only provider of approved, fully-integrated systems for administering immunomodulatory therapy through ECP. Its Therakos therapeutic platforms, including the latest generation THERAKOS™ CELLEX™ Photopheresis System, are used by academic medical centres, hospitals, and treatment centres in nearly 40 countries and have delivered more than 1 million treatments globally. For more information, please visit www.therakos.co.uk. For important safety information related to the THERAKOS™ CELLEX™ Photopheresis System, please visit https://www.therakos.co.uk/important-safety-information-hp. Mallinckrodt is a global business consisting of multiple wholly owned subsidiaries that develops, manufactures, markets and distributes specialty pharmaceutical products and therapies. The company’s Specialty Brands reportable segment’s areas of focus include autoimmune and rare diseases in specialty areas like neurology, rheumatology, nephrology, pulmonology and ophthalmology; immunotherapy and neonatal respiratory critical care therapies; and analgesics. Its Specialty Generics and Amitiza reportable segment includes specialty generic drugs, active pharmaceutical ingredients and AMITIZA® (lubiprostone). To learn more about Mallinckrodt, visit www.mallinckrodt.com. 1. Jagasia M, Arora M, Flowers ME, et al. Risk factors for acute GVHD and survival after hematopoietic cell transplantation, Blood. 2012 Jan 5;119(1):296-307. doi: 10.1182/blood-2011-06-364265. Epub 2011 Oct 18.